The latest politician to announce he's ready to be president is Sen. Marco Rubio (R-Fla.), the freshman senator known for his impressive water-sipping skills. Unlike his Republican colleague Sen. Rand Paul, Rubio didn't reveal his intention for the presidency by trying to pass a law saying he can run for both president and senator — nope, Rubio just sat down with ABC's John Karl on The Week, which aired Sunday night. There's a lot of issues going on in the country, and immigration right now is not at the forefront. But he hasn't totally given up! We're not going to grant blanket amnesty to 12 million people. We're also not going to round up and deport 12 million people. If Hillary Clinton does run in 2016, you can expect a lot of the B-word — Benghazi, that is. I’m sure she’s going to go out bragging about her time in the State Department. She’s also going to have to be held accountable for its failures, whether it’s the failed reset with Russia or the failure in Benghazi that actually cost lives. 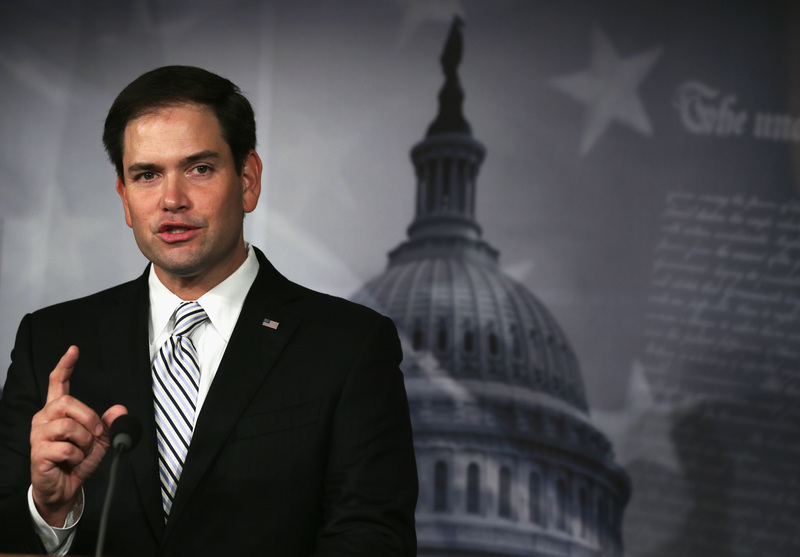 So what grade does Clinton get in Rubio's foreign policy class? I don't think she has a passing grade [as Secretary of State]. I would prefer we focus not on the fundraising elements or the political elements of it. Our climate is always changing. We’ve had hurricanes in Florida forever. What I have a problem with is these changes to our law that somehow politicians say are going to change our weather. That’s absurd. ... [T]o say you are going to pass a bill that's going to change the weather is a lie and you're going to devastate our economy. I do not believe that human activity is causing these dramatic changes to our climate the way these scientists are portraying it. That’s what I do not believe. But Rubio also has some bright spots. He once quoted "modern-day poets" Jay-Z and Wiz Khalifa during a filibuster, which is perhaps one of his best speeches. Ever.